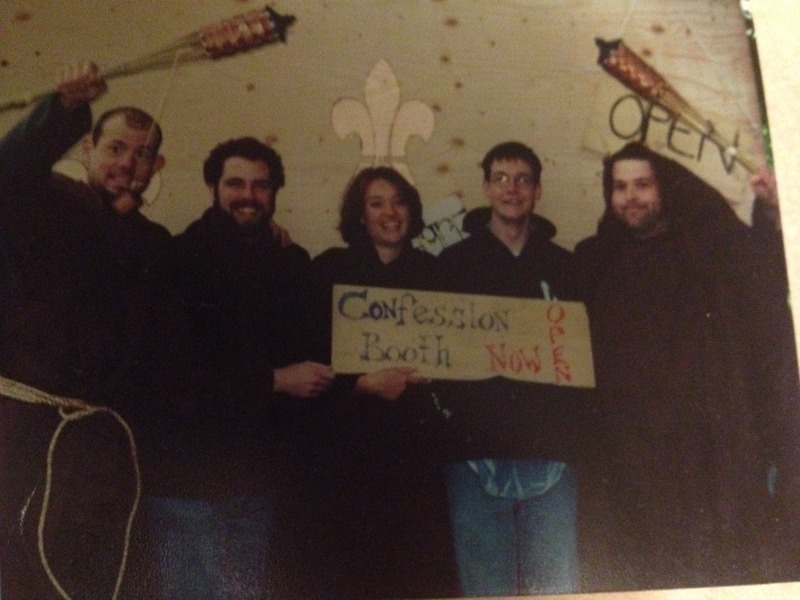 A decade ago, Donald Miller wrote our story… he wrote about a Confession Booth at Reed College. When Don wrote it, the entire story consisted of only a few paragraphs and it started a social movement that no one could have predicted. Over the years I have been asked many times to write a more full telling of that beloved story. This is the first time I have had the courage to print it. My phone rang in my pocket. I couldn’t answer because of the four foot by eight foot piece of plywood I had precariously balanced on my hip. 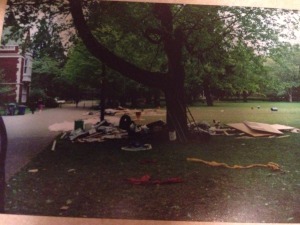 I was about two thirds of the way across the panoramic lawn in front of Reed’s main campus. The college is encircled by a wide lawn moat, broadly separating the castle-like buildings from the surrounding neighborhoods. I carefully eased the wood to the ground and pulled the phone from my pocket. “Hello?” I said, short of breath and relieved to put down the awkward board. My eyes looked up around, taking in the cascading trees and historic buildings all around. “Please hold for Lars Larson” came a voice from the other end, quick and business-like. I held, standing alone in the middle of a field, thirty-two square feet piece of plywood leaning against my hip. I was more than surprised by the call. Lars Larson is quite a fixture in Portland. I imagine every city has a Lars. He is the conservative radio talk show personality, tackling all issues political and social within Portland, the U.S. and the world. He is witty and sharply opinionated. He knows, just like the innumerable national talk-show pundits, that you need to maintain poignant and polarizing positions to maintain a loyal following. “Well…” Before I could respond, Lars interrupted. “Whoops, we are back on the air, I will be back in six minutes.” Just like that I was alone again, just me, my piece of wood and easy-listening music through the headset. Sure enough, exactly six minutes later Lars was back. 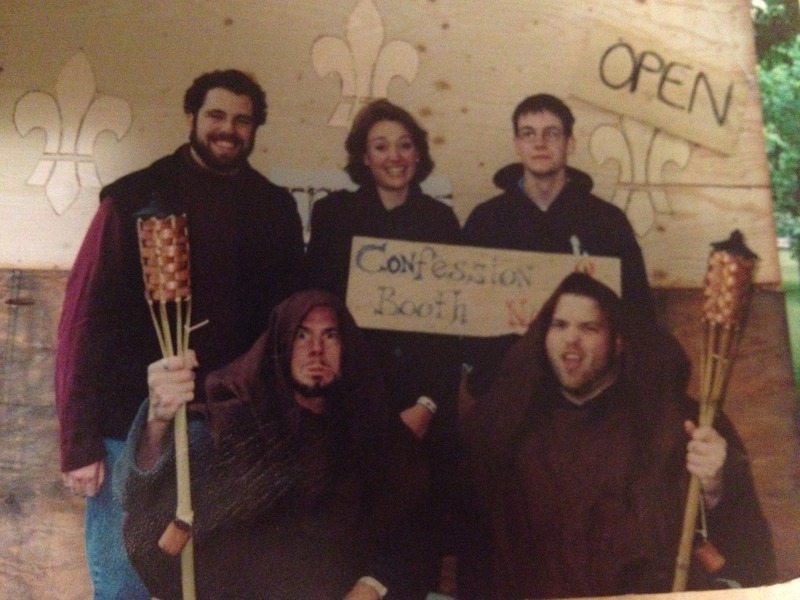 “Hey, sorry to keep you waiting… Let’s see, I love the creativity, building a confession booth and all that. Now the real question is how are you going to turn the tables on those liberal Reed folks?” He punctuated “liberal” when he said it. “That is not really the point,” I said, a little sheepishly. He said, “Don’t worry about it.” I don’t think either of us meant it. The line went silent and I was once again alone. I leaned over and heaved the heavy board back up. I adjusted it for balance. Walking was clumsy and I still had a good hundred yards to go. The weight of the board mirrored the feeling in my heart. What the hell were we doing? What had I gotten myself into? Two weeks before we had been sitting around one of the long tables in the student commons, next to the ceiling high windows that overlooked the forested creek running through the center of campus. I was still fairly new to campus and most days felt like a wide-eyed freshman. There were just six of us. Don and I, along with some of the students who we had learned to lean upon and even submitted ourselves to: Nadine, Penny, Ivan and Mitch. There is something strangely comforting in knowing I was the dumbest person at the table. We had gathered to talk about the last month of school. Specifically, we were bantering about Renn Faire. Renn Faire probably needs a bit of an explanation. Short for “Renaissance Faire,” it is a playful and celebrative weekend at the end of each school year. It is a rockus release, climaxing the long climb up one of America’s most academically stringent schedules. Work well done: senior theses are complete, final projects turned in, and the tens of thousands of read pages can be returned to the bookshelf, the library or the used bookstore. Reed students study harder than any other students I have ever witnessed. They also play hard. And Renn Faire provides a delicious playground. Reed celebrates its commitment to self-discovery and personal experimentation. This belief fills the classroom and if fuels the small conference learning style across campus. While the extent of this experimentation is left to each student’s imagination, there is little doubt that students are released to try all things in their enlightenment quest. Though I have never heard the faculty or administration directly encourage any specifics, the message seems clear. For instance, Renn Faire includes an onsite clinic, with staff specially trained to help students come down off bad-trips. Often these students come from a large central lounge where the windows are blacked out and into the darkness are arranged couched stations with psychedelic art and screens filled with images in slow motion. I have seen a lot of crazy stuff in my life, but I was not prepared for all this weekend had to offer. The table sat uncharacteristically silent. The thoughts came slowly. We all agreed that this was a complicated conversation. We also knew that if we did add something to this festival of experience, it needed to be something legit. Topics like this start awkwardly. We brainstormed about Renaissance times and how differently the church functioned back then. We brainstormed several truly bad ideas (many of which, admittedly, were contributed by me) such as processionals, sprinkling blessings and even burning martyrs on the stake. 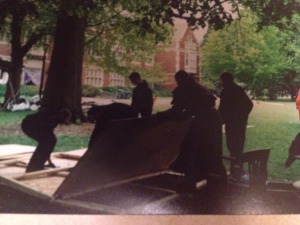 Eventually, and I honestly don’t remember who it was, someone suggested that we build a confession-booth on campus. Immediately our energy increased. We couldn’t help but wonder how our fellow expressive, creative and courageous Reed students would respond if they were offered a chance to confess their sins. Would they embrace it? Or would it reek of religion and judgment? Would it be just another well-intentioned misstep by the Christian church, like so many things they have experienced before? Would it just push them further away from Jesus? After talking about it for some time, we began hesitantly leaning toward consensus. Ivan was holding out. He knew he would be volunteering in the clinic all weekend. He was also a wise and cautious fellow at heart. That was when I said it. It was an idea that had been percolating for a few days, ever since talking to my buddy Kurt about Christian arrogance. The idea quivered in the middle of the table like an anxious puppy. We all stared at it. Then we looked carefully at one another. No one spoke. Every one of us knew. This was a God-idea. This is something we had to do. The Friday of Renn Faire arrived. It was early afternoon. I was happy to provide mindless labor while the students led the work. Mitch had recruited a couple of friends and had the construction well in order. He had built a barn the summer before and was thrilled to have a hammer in his hand again. Mitch had chosen a nice spot, just off the main courtyard, next to a path, under a couple of White Birch and a Norway Maple. 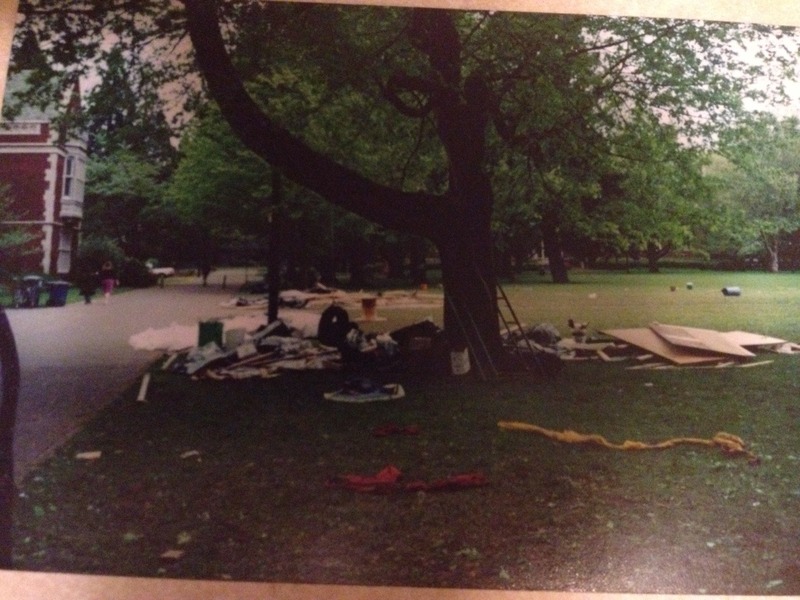 We didn’t have the only construction project in the works. Not far away a humungous pile of wood was being assembled. “What is going on over there?” I asked one of Mitch’s friends. “Burn it down?” I asked. It was at this moment that I realized I would be spending the weekend sealed inside a plywood box. The booth was really taking shape and I must admit, I was quite impressed. Mitch had thought of everything. There was a slant to the roof in case it rained. Inside there were small shelves for candles. A chest high wall divided the two chambers and a simple curtain had been rigged to complete the confession booth aura. Golden fleurs-de-lis adorned the exterior and the booth was encircled with torches. It was an inspiring accomplishment… an infuriatingly inspiring accomplishment. Each creative flourish made it more and more difficult for me to concoct a plan to cancel the entire idea. I might just hate these people. Dark inevitably came. The torches were lit. Bells began to ring. My wife draped me in the burlap monks’ robes she had made. It fit loose and scratchy. There was a rope belt and a canopy-hood that, when pulled up, surrounded my head and hid my face. I felt like a character from a Monty Python sketch. My student-friends were excited to begin. A couple of them had cowbells to ring. We all wondered if anyone would enter the booth… or would it all be ignored; a glorious failure? I took my place inside. 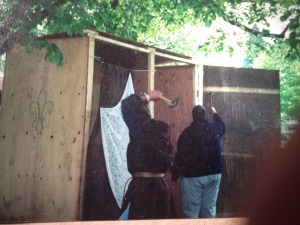 The “priest side” of the booth had a plywood door with a heavy latch we could seal from the inside. The other side had a curtain. I latched the door and sat on the stool inside. I leaned back against the far corner, the hood over my head. Candlelight danced about. My chest was filled with both the heart-pounding nausea like when you are about to break up with someone, and the gut twisting anxiety you feel right before you have to give a public speech. For now my goal was simply to not throw up. I didn’t have to wait for long. The first student pulled the curtain back and peeked into the candle lit cabinet. He sat down and I hoped the cowl hid the fear in my eyes. He was wearing a multi-colored shirt with wide vertical stripes. It draped low and open in the front. His hair was just long enough to pull out of the way and hook behind his ear. He just sat, not saying a word. His eyes were collecting every flame-lit detail. He didn’t move. He just stared at me. There was a slight tilt to his head. This was when it occurred to me that I didn’t really know what I was going to say next. Don and I had discussed some general thoughts, but I had not prepared any specifics. Suddenly my words took off with a life all their own, “Would you forgive us for abusing kids placed under our care? Will you please, please forgive us for the role we played in slavery and racism in the US and around the world? Forgive us for wars waged in God’s name? Will you forgive us for the ways we communicate judgment, arrogance and hatred every single day?” The words poured out. I couldn’t stop my smile. Plus, I didn’t know fuckingly was a word. Then he did something that I had not prepared for… He forgave me. His words were simple, “I forgive you. I forgive you for all of it.” His voice was soft and his eyes locked on mine. He did not cheapen the moment with excuses or justifications. He did not try to rescue me by telling me most those things happened before I was even born. He did not play any of those games that are so commonplace in human exchange. He simply absolved me of my sin. The power of words… the power of forgiveness is an intoxicating thing. Over the weekend dozens of students slipped in and then out of our booth, each surprised and expectant. Some stayed for just a few minutes. Most lingered as long as half an hour. Without exception, each one offered us the gift of forgiveness. It was like nothing I had ever experienced before. It is a great irony that there is nothing in life that I dread more than begging someone to forgive me, and every time I succumb to the dread, I rob myself of one of life’s great treasures. Often the conversation would turn to free-flowing exchange. 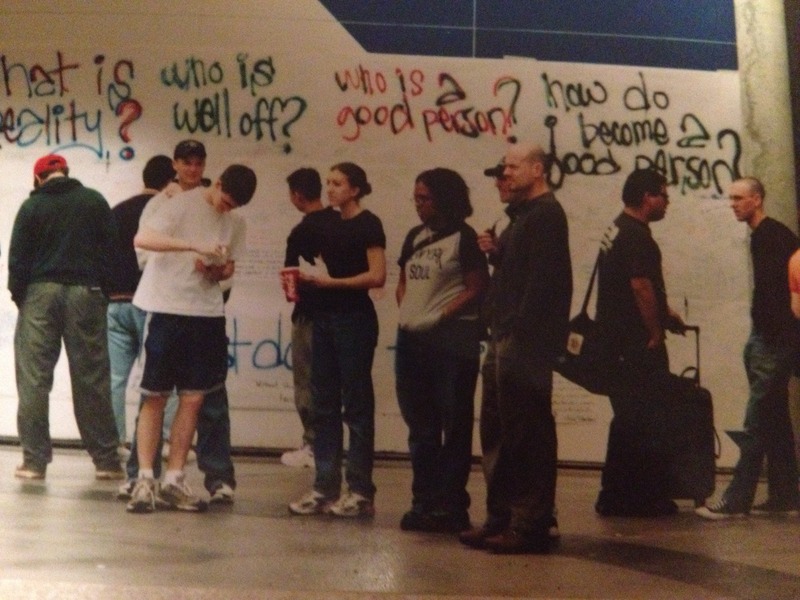 With honesty so heavy in the tight space, the students would often share about their pain: addictions, abuse, regrets, shame. More often than not we would also talk about Jesus. It sounds like a cliche, but there truly seemed to be three of us crammed inside that plywood box. I daydream about heaven sometimes. I try to imagine what we are going to do with all that time. What will our life be like? What will fill our days? It is funny… freedom comes from confession. Almost without exception, every Reed student who entered the confession booth responded to our honesty with like sincerity and surprise. Eventually, the conversation would turn to free-flowing exchange. With freedom so heavy in the tight space, the students would often share about their pain: addictions, abuse, regrets, shame. More often than not we would also talk about Jesus. It sounds like a cliche, but there truly seemed to be three of us crammed inside that plywood box. The love of Jesus for every person is not a sales pitch… it is not a not about religious leveraging… and it is not about my team versus the other. The love of Jesus is for all people… it is unto all people… and, much to my surprise, it may just show up through the words of ANY person. May He be in the mouth of each who speaks unto you.